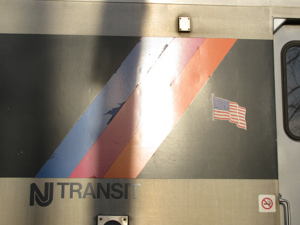 According to reporting (Dec. 18) by Curtis Tate for the Gannett papers (USA Today North Jersey Network), NJ Transit hired or promoted ten employees connected to the administration of outgoing Gov. Chris Christie, even while experienced staff were leaving; in many cases, the Christie protégées enjoyed salary increases of as much as $70,000 over their previous jobs, and a minimum of $13,000. In some cases, the new hires made more than the NJT employees they replaced. All but one ended up making at least $100,000 at NJT; the median salary for all state workers in 2016 was about $73,000. NJT, for its part, denies that Christie exerted influence over the hires, or that career NJT employees were passed over in favor of the Christie administration hires. One of the questionable hires is Jacqueline Halldow, NJT's chief of staff. She should be qualified for the job: she held the same position until leaving for work in Trenton for Christie. In the move to Trenton, her salary increased from the $132,00 she earned at NJT to $140,000. But on her return to NJT, only 14 months later, her new salary jumped to $156,000. Amy Herbold received the biggest salary increase in her move to NJT in 2016, where she became deputy executive director at a salary of $190,000, a $70,000 jump over her previous job as a Christie aide. At NJT she replaced Neil Yellin, who was fired by NJT; Yellin, 66, has filed an age discrimination suit against NJT, charging that Herbold had nowhere near the experience and qualifications that Yellin has. Yellin's salary at NJT was about $10,000 less than Herbold's. Herbold subsequently resigned from NJT in November. Other Christie veterans also enjoyed lucrative positions at NJT, and enjoyed frequent promotions and salary increases. 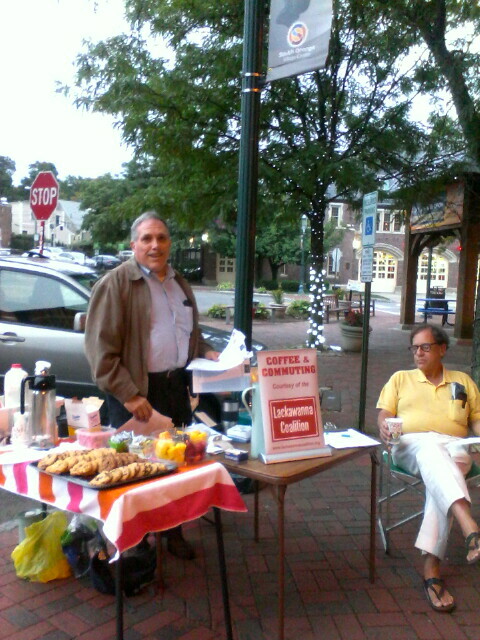 Eric Daleo, who once worked in the law firm that represented Gov. Christie in the "Bridgegate" affair, then became a state employee as a representative of the state police, earning $110,000. He then somehow found employment at NJT for $132,000, but then was promoted to assistant executive director of capital programs and planning, at a cool $175,000. Another veteran of the law firm, Megan Strickland, also found success at NJT and is now chief of capital compliance, budget, and administration, earning $141,000. Further reporting by Larry Higgs for nj.com (Star-Ledger, Dec. 19) included facts from the northjersey.com article. Higgs' article quoted former NJT compliance officer Todd Barretta as saying that NJT has a "culture of (employees) going along with what political appointees want or (they) get out." The Lackawanna Coalition has expressed its objections to a proposal by the Port Authority of New York and New Jersey to extend the Port Authority-Trans Hudson (PATH) line from Newark Penn Station to the monorail that serves Newark Airport. In a statement submitted at an information session in downtown Newark, the Coalition objected to the project on several grounds. The project will not improve the convenience of airport access for our primary constituents; those who use NJ Transit's Morris & Essex, Montclair-Boonton and Gladstone lines. The journey to an airport terminal usually requires four segments: train to Broad Street Station, light rail or bus to Penn Station, NJ Transit train to the Airport station and the monorail to the airport terminal. The proposed PATH extension would preserve the four-seat ride by substituting a PATH segment for an NJ Transit segment from Penn Station. The Coalition disputed the cost-effectiveness of spending money for a plan that does not eliminate the inconvenience of having to make three transfers. The Coalition also questioned the wisdom of spending the projected cost of $1.7 billion for a line that duplicates current NJ Transit service, when other projects that would improve mobility between New Jersey and New York City need to be built, and capital funding is needed to build them. These projects include new tunnels into Penn Station, whether or not other components of the proposed Gateway Project are also built, and an upgraded and expanded Port Authority Bus Terminal. We also disputed the Port Authority's claim that the project would benefit the surrounding neighborhood, citing its emphasis on a parking deck that was part of a local development plan. The Coalition called for a study of airport access, which would consider alternatives to the proposed PATH extension. 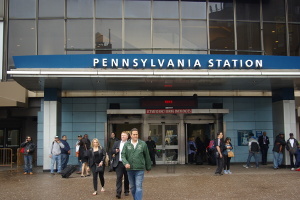 These include shuttle trains between Newark Penn Station and the Airport station when there is room for them on the railroad, and shuttle buses between Penn Station and the airport terminals themselves. A shuttle bus system, which would use buses specifically designed for airport customers, could also eliminate the need to spend capital dollars to replace the current airport monorail, which is nearing the end of its useful life. Our statement concluded: We object to the current plan. It is inconvenient for our constituents, it does not actually provide access to the airport terminals, and it wastes money that can be better spent for other projects, which are needed more urgently." New Jersey Governor-elect Phil Murphy, after meeting with the state's two U.S. senators, called the Gateway project for new rail tunnels under the Hudson as their "top of the list" priority, according to reporting by James Nash (Dec. 12) for the North Jersey Record and other Gannett papers. Murphy says he plans to meet with New York Gov. Andrew Cuomo to enlist his support for the project, estimated to cost $27 billion. "It's a game changer for New Jersey and it's a game changer for New York," Murphy told reporters. Senators Booker and Menendez, who also attended the press conference, had their own comments on rail transit, Menendez reminding reporters that outgoing Gov. Chris Christie seven years ago forfeited $3 billion in funding for an earlier proposed tunnel project, saying that the project would cost New Jersey taxpayers billions in cost overruns; Booker said he plans to push for more Federal security at rail stations. The press conference on Monday, Dec. 11, was overshadowed by a terrorist bombing attack that morning in Manhattan. 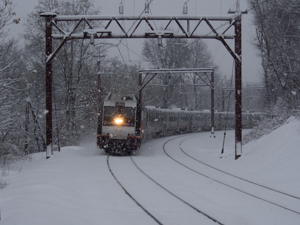 Often, when storms or other emergencies threaten, NJ Transit announces vague plans to cope with it, such as saying "trains will operate on a modified Saturday schedule." But just what is that modified schedule? Often, riders were left wondering when their next train might, or might not, arrive. A number of other transit systems have clarified this by formalizing schedules that will be used in such situations, and announcing them in advance. Now NJT is going to do the same thing, according to reporting by Larry Higgs for NJ Advance Media (nj.com). NJT will publish in advance several "levels" of reduced service, and then announce at the time of the event which level will be observed during the emergency. 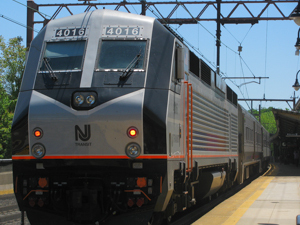 The schedules will be available in printable form on NJT's website all year long; the first two schedules to be posted will be for two levels of rail service, according to NJT executive director Steven Santoro. Printed schedules will also be available at key stations, NJT said. While Amtrak officials knew that tracks at New York's Penn Station were deteriorating to the point of danger, getting permission to perform repairs was not easy. According to investigative reporting by Michael LaForgia for the New York Times (October 9), conflicting projects, with political overtones, hampered the urgent calls by Amtrak engineering and track maintenance personnel to proceed with repair work. The situation finally boiled over with derailments of trains on March 24, April 3, and July 6, all at the complex junction of trackwork at the west end of the station. When the derailments started to occur, Amtrak declared that the only way to address the many problems was to reduce the capacity of the station for eight weeks during the summer, which led to massive rescheduling of trains and rerouting of commuters, notably on the Morris & Essex Lines of NJ Transit, where most weekday trains were diverted to Hoboken. While money is a factor in getting the work done, an even more precious commodity is "track time," the closing of tracks so work can be done. Amtrak is forced to ration track time to several competing projects, to limit the disruption to scheduled train service. According to the article, a main competitor for track time needed for track repairs has been the construction of the Moynihan train hall -- the conversion of the General Post Office west of Eighth Avenue to a new facility that will mainly serve Amtrak and Long Island Rail Road passengers. The new train hall has been a pet project of New York Gov. Andrew Cuomo; in turn, Cuomo's support has been critical to Amtrak's plans for a massive expansion of Penn Station called Gateway. So, the article suggests, Amtrak was sensitive to the needs of the Moynihan project -- to the extent that track repairs were sidelined until it was too late. Over a period from 2013 to 2017, according to the Times' calculations, contractors for Moynihan were granted 2200 hours of weekend track time, while Amtrak 's crews got only 1800 hours. While the Moynihan contractors do not work on the tracks themselves, they need the tracks taken out of service so they can install columns and girders. Competition for track time and other resources within Amtrak was intense. In March, 2017, as repairs were finally getting underway, Amtrak's head of track maintenance, Andrew Keefe, learned that the track project would stretch out for a year or more, and that Amtrak was considering giving even more priority to Moynihan. Mr. Keefe, the Times article says, lost his temper, pounding the table and saying, "You're not going to be happy until you put a train on the ground (i.e., cause a derailment)." Mr. Keefe was prescient; just weeks later came the first derailment. Soon, an accelerated project, requiring the eight-week summer "blitz," was announced, although Amtrak "had long regarded disrupting weekday service as anathema," said the Times, quoting Amtrak co-CEO Charles Moorman. But this summer, that's what Amtrak concluded it had to do. Although this summer's work achieved a lot of progress in the deferred maintenance at Penn Station, there is a lot more to do, and Amtrak would not foreclose the possibility that more weekday work intervals might be needed in the future. NJ Transit and the other rail operators into Manhattan generally received high marks for handling the schedule changes. A typical media report, by Patrick McGeehan for the New York Times (Sept. 2), says that the "summer of hell" widely predicted for commuters never materialized. The article quoted NJT Executive Director Steven Santoro's testimony at a recent hearing in Trenton: Mr. Santoro said that New Jersey Transit riders “made an almost seamless transition from their old travel patterns to the temporary ones that were in effect throughout the Amtrak repair outage.” Riders on the Morris & Essex lines enjoyed a bonus of fare reductions of roughly 50%, and free transfers to and from PATH trains and NY Waterway ferry services from Hoboken. The experience of using Hoboken instead of New York as their gateway to Manhattan left some riders impressed with the alternative; the Times article quoted Karen Roth, a commuter to Manhattan from Rockaway, N.J., as saying that while she would resume riding to New York Penn once the trains began running again, she said that "the difference is I’m no longer averse to just getting on the train to Hoboken to get to work." And while crew shortages caused the cancellation of many trains during the summer, Ms. Roth said that she had not encountered a single cancellation on the trains she rode. According to Mr. Santoro, the cost to NJ Transit of the rescheduling, and for paying for riders' PATH and ferry fares, was about $25 million; he said NJT might seek partial reimbursement from Amtrak for NJT's expenses. But he said there would be no NJT fare increase during the current fiscal year. The Lackawanna Coalition believes that NJ Transit did a credible job during the summer work program; however, the Coalition believes that even better services could have been offered if NJT had solicited advice from commuters and their advocacy groups in the planning stage.